Theory and practice in city planning have never been known for their compatibility. The planner, dealing with stresses such as the personalities at work in a board meeting and coping with the realities of fund raising, political realities, and the like, can find little guidance in the theory of the trade. The issues of poverty groups, whether rural or urban, the provision of services, and the packaging of them are seemingly insuperable. 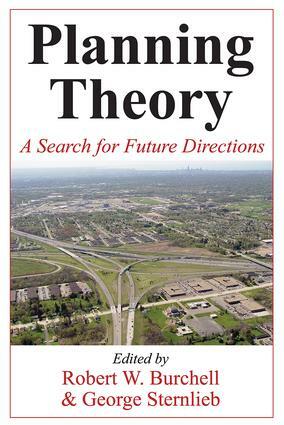 The sheer frustration in the inability to deliver, which so many planners feel, can result in considerable impatience and a questioning of the relevance of theory.The editors argue that this state of affairs, though understandable, is unacceptable. While short-range meliorismwithout sense of perspective may be good for the practitioner's individual psyche, the cost may be borne by the long-run best interests of the groups to be served. The risks of a lack of perspective and the experiences generated by this phenomenon are too serious in their implications to permit the process to continue.In this new age of anxiety it is essential for both planners and theorists to understand their roles as well as provide guidance in shaping them. Burchell and Sternlieb have thus gathered here a variety of individuals, all of whom in their separate and distinct fashions are seasoned, both in practice and in theory. The book is divided into five sections: Physical Planning in Change, Social Planning in Change, Public Policy Planning in Change, Economic Planning in Change, and a final section detailing the roles of planners and who they are. These shared puzzlements and insights will prove useful to all practitioners and theorists in the planning field. SECTION V: WHAT ARE PLANNERS? WHAT DO PLANNERS DO? AND HOW ARE THEY PREPARED FOR THEIR TASKS?